Mister Boo is thankful for monocular vision, but says the Cone of Shame can get lost pretty much any old time now. Turkish and Mia are thankful that nobody has tried to put Cones of Shame on them lately, and so are we. That time of year again, is it? Mister Boo is thankful for monocular vision following successful surgeries to remove one bad eye and repair one not-so-bad eye. Also for the delicious bits of chicken breast that accompany his four-times-daily rounds of post-op medication. Field Marshal Turkish von Turkenstein (commander, 1st Feline Home Defense Regiment) and Chief of Staff Miss Mia Sopaipilla are thankful for full bowls of top-shelf cat chow that for some reason are on my kitchen counter. Their staff is thankful for paying work, a flat roof over their freshly New Mexican heads, and the sod firmly underfoot where it belongs. Here’s hoping Thanksgiving 2014 finds you likewise. Meanwhile, you still can get anything you want at Alice’s Restaurant, kid. Don’t forget to pick up the garbage. This entry was posted on November 27, 2014 at 9:00 am and is filed under Cats, Dogs, Family, Friends, Holidays. You can follow any responses to this entry through the RSS 2.0 feed. You can leave a response, or trackback from your own site. Happy Thanksgiving to you and the missus ! Thanks for the update – Happy Thanksgiving to all! Happy Thanksgiving to POG, Herself, The Menagerie ……and all you Mad Dog readers and contributors! Have a really nice day! We are doing a downsized traditional meal for two. Sandy has a bottle of Zapara Sangiovese to finish off, and for me a Pilsner Urquel with the meal and Black Butte Porter for desert. 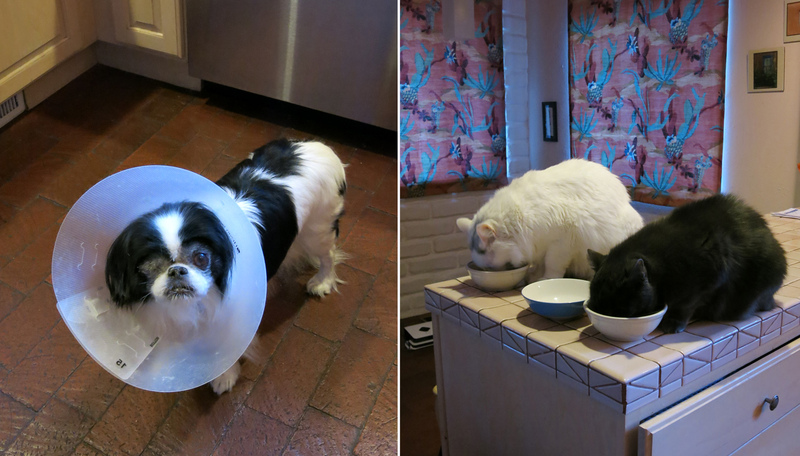 Glad Mr. Boo is doing well, and I have no idea how the cats got on the counter. Oh, I almost forgot. We will be having mashed rutabagas with the meal. Yum. Thanks, of course, for remembering to post the link to Alice’s Restaurant. No Thanksgiving could be complete without it. Happy Thanksgiving to you and your family Patrick (including the four legged kiddos)! Lots to be thankful for big and small, but definitely want to include a big thanks for the blog and the community of readers. Thanks for bringing the cycling, funny, insightful, satirical, happy, sad, joyful…all of it. Happy Thanksgiving to you Patrick, Herself, the four legged bosses and my fellow readers/commenters. Wishing you all the most happy possible in this Thanksgiving. Drove to the Better Half’s folks’ farm this a.m. 200 miles, and as we’re getting in the car, our 4 year old grabs a kitchen timer. Once we were on the road and they were a captive audience, I forced Alice’s Restaurant on them. Those who didn’t want to listen were free to walk. You know it’s thanksgiving in Nebraska when you’re looking at nine different pies on the counter. The angels in the American Academy kitchen took real good care of us for Thanksgiving. Most of ’em are ‘Muricans so they well know the plan. I’m thankful my wife let me join her here since I otherwise have ZERO qualifications to hang around in this rarefied academic climate. Happy turkey-day to all!!! You and Herself do well by the animals in your family – as you should – but lately you have stepped up to another level with Mr. Boo. Chapeau, and good holidays to you all. A belated happy thanksgiving to all of you up North who celebrate it. I was at a celebration down South & a good time was had by all, (even managed to finish).